Julian Construction, Inc. (www.julianconstruction.com), a foundation repair and construction company in Los Angeles, lists 4 of the most commonly used retaining walls and explains when they are used and why. 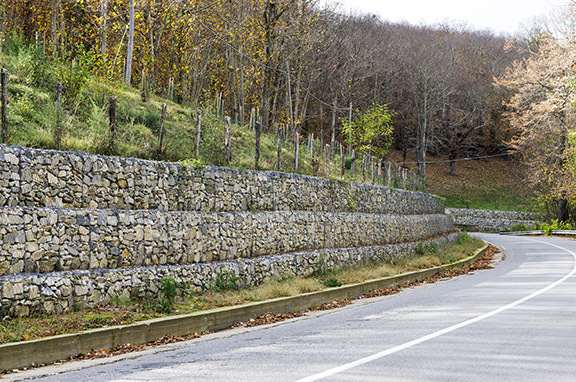 Gravity retaining walls rely on sheer gravity to hold back soil and gravel. They are wider at the base than at the top, and do not require complicated engineering. They can be strong, but over time bow outwards if done incorrectly. Due to the necessarily wide base they require a lot of material and don’t work well for walls taller than 4 feet. Cantilever retaining walls are also wider at the bottom than the top, but they are attached to a steel or concrete base that extends back under the soil they are holding back, thus taking further advantage of gravity and the weight of the soil trying to push them over. They are much stronger than gravity retaining walls. Sheet pile retaining walls are made with “sheets” of material such as wood, concrete, or steel, that are driven partially into the ground (usually 2/3 underground and 1/3 above). Anchored retaining walls can be any of the above, but they have additional support in the form of steel cables attached to the retaining wall that are anchored in the soil or rock they are holding back.